For Shakespeare's play, see Richard II (play). Richard II (6 January 1367 – c. 14 February 1400), also known as Richard of Bordeaux, was King of England from 1377 until he was deposed on 30 September 1399. Richard, a son of Edward, the Black Prince, was born in Bordeaux during the reign of his grandfather, Edward III. Richard was the younger brother of Edward of Angoulême, upon whose death, Richard, at three years of age, became second in line to the throne after his father. Upon the death of Richard's father prior to the death of Edward III, Richard, by primogeniture, became the heir apparent to the throne. 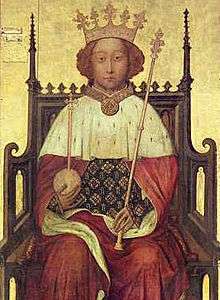 With Edward III's death the following year, Richard succeeded to the throne at the age of ten. During Richard's first years as king, government was in the hands of a series of councils. Most of the aristocracy preferred this to a regency led by the king's uncle, John of Gaunt, yet Gaunt remained highly influential. 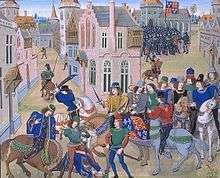 The first major challenge of the reign was the Peasants' Revolt in 1381. The young king played a major part in the successful suppression of this crisis. 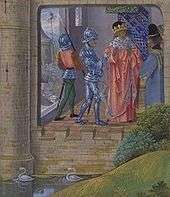 In the following years, however, the king's dependence on a small number of courtiers caused discontent among the influential, and in 1387 control of government was taken over by a group of aristocrats known as the Lords Appellant. By 1389 Richard had regained control, and for the next eight years governed in relative harmony with his former opponents. 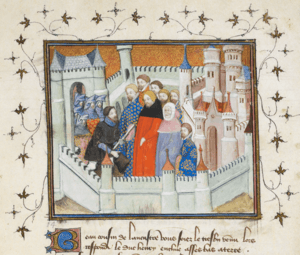 In 1397, Richard took his revenge on the appellants, many of whom were executed or exiled. The next two years have been described by historians as Richard's "tyranny". In 1399, after John of Gaunt died, the king disinherited Gaunt's son, Henry of Bolingbroke, who had previously been exiled. Henry invaded England in June 1399 with a small force that quickly grew in numbers. Claiming initially that his goal was only to reclaim his patrimony, it soon became clear that he intended to claim the throne for himself. Meeting little resistance, Bolingbroke deposed Richard and had himself crowned as King Henry IV. Richard died in captivity in February 1400; he is thought to have been starved to death, although questions remain regarding his final fate. Richard was said to have been tall, good-looking and intelligent. While probably not insane, as earlier historians believed, he may have had what modern psychologists would call a "personality disorder" towards the end of his reign. Less warlike than either his father or grandfather, he sought to bring an end to the Hundred Years' War that Edward III had started. He was a firm believer in the royal prerogative, something which led him to restrain the power of the aristocracy, and to rely on a private retinue for military protection instead; in contrast to the fraternal, martial court of his grandfather, he cultivated a refined atmosphere at his court, in which the king was an elevated figure, with art and culture at the centre. Richard's posthumous reputation has to a large extent been shaped by Shakespeare, whose play Richard II portrayed Richard's misrule and his deposition by Bolingbroke as responsible for the fifteenth century Wars of the Roses. Modern historians do not accept this interpretation, while not exonerating Richard from responsibility for his own deposition. Most authorities agree that, even though his policies were not unprecedented or entirely unrealistic, the way in which he carried them out was unacceptable to the political establishment, and this led to his downfall. Richard of Bordeaux was the younger son of Edward, the Black Prince, and Joan of Kent ("The Fair Maid of Kent"). Edward, heir to the throne of England, had distinguished himself as a military commander in the early phases of the Hundred Years' War, particularly in the Battle of Poitiers in 1356. After further military adventures, however, he contracted dysentery in Spain in 1370. He never fully recovered and had to return to England the next year. Joan of Kent had been at the centre of a marriage dispute between Thomas Holland, Earl of Kent, and William Montacute, Earl of Salisbury, from which Holland emerged victorious. Less than a year after Holland's death in 1360, Joan married Prince Edward. Since she was a granddaughter of King Edward I and a first cousin of King Edward III, the marriage required papal approval. Richard was born at the Archbishop's Palace, Bordeaux, in the English principality of Aquitaine, on 6 January 1367. According to contemporary sources, three kings – "the King of Castille, the King of Navarre and the King of Portugal" – were present at his birth. This anecdote, and the fact that his birth fell on the feast of Epiphany, was later used in the religious imagery of the Wilton Diptych, where Richard is one of three kings paying homage to the Virgin and Child. His elder brother Edward of Angoulême died in 1371, and Richard became his father's heir. The Black Prince finally succumbed to his long illness in 1376. The Commons in parliament genuinely feared that Richard's uncle, John of Gaunt, would usurp the throne. 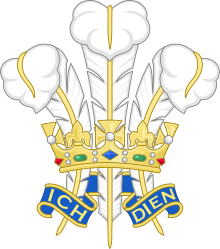 [a] For this reason, the prince was quickly invested with the princedom of Wales and his father's other titles. 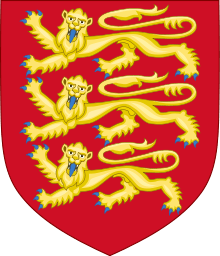 On 21 June the next year, Richard's grandfather Edward III also died, and at the age of ten Richard was crowned king on 16 July 1377. Again, fears of John of Gaunt's ambitions influenced political decisions, and a regency led by the King's uncles was avoided. Instead the king was nominally to exercise kingship with the help of a series of "continual councils" from which John of Gaunt was excluded. Gaunt, together with his younger brother Thomas of Woodstock, Earl of Buckingham, still held great informal influence over the business of government. However, the king's councillors and friends, particularly Sir Simon de Burley and Robert de Vere, Duke of Ireland, increasingly gained control of royal affairs and earned the mistrust of the Commons to the point where the councils were discontinued in 1380. Contributing to discontent was an increasingly heavy burden of taxation levied through three poll taxes between 1377 and 1381 that were spent on unsuccessful military expeditions on the continent. By 1381, there was a deep-felt resentment against the governing classes in the lower levels of English society. Whereas the poll tax of 1381 was the spark of the Peasants' Revolt, the root of the conflict lay in tensions between peasants and landowners precipitated by the economic and demographic consequences of the Black Death and subsequent outbreaks of the plague. The rebellion started in Kent and Essex in late May, and on 12 June, bands of peasants gathered at Blackheath near London under the leaders Wat Tyler, John Ball and Jack Straw. John of Gaunt's Savoy Palace was burnt down. The Archbishop of Canterbury Simon Sudbury, who was also Lord Chancellor, and the king's Lord High Treasurer, Robert Hales, were both killed by the rebels, who were demanding the complete abolition of serfdom. The king, sheltered within the Tower of London with his councillors, agreed that the Crown did not have the forces to disperse the rebels and that the only feasible option was to negotiate. It is unclear how much Richard, who was still only fourteen years old, was involved in these deliberations, although historians have suggested that he was among the proponents of negotiations. The king set out by river on 13 June, but the large number of people thronging the banks at Greenwich made it impossible for him to land, forcing him to return to the Tower. The next day, Friday, 14 June, he set out by horse and met the rebels at Mile End. The king agreed to the rebels' demands, but this move only emboldened them; they continued their looting and killings. Richard met Wat Tyler again the next day at Smithfield and reiterated that the demands would be met, but the rebel leader was not convinced of the king's sincerity. The king's men grew restive, an altercation broke out, and William Walworth, the mayor of London, pulled Tyler down from his horse and killed him. The situation became tense once the rebels realised what had happened, but the king acted with calm resolve and, saying "I am your captain, follow me! ", he led the mob away from the scene. [b] Walworth meanwhile gathered a force to surround the peasant army, but the king granted clemency and allowed the rebels to disperse and return to their homes. It is only with the Peasants' Revolt that Richard starts to emerge clearly in the annals. One of his first significant acts after the rebellion was to marry Anne of Bohemia, daughter of the Holy Roman Emperor (King of Bohemia Charles IV) and his wife Elisabeth of Pomerania, on 20 January 1382. The marriage had diplomatic significance; in the division of Europe caused by the Great Schism, Bohemia and the Empire were seen as potential allies against France in the ongoing Hundred Years' War. [c] Nonetheless, the marriage was not popular in England. Despite great sums of money awarded to the Empire, the political alliance never resulted in any military victories. Furthermore, the marriage was childless. Anne died from plague in 1394, greatly mourned by her husband. On his return to London, the king was confronted by Thomas of Woodstock (now Duke of Gloucester), Arundel and Thomas de Beauchamp, Earl of Warwick, who brought an appeal[d] of treason against de la Pole, de Vere, Tresilian, and two other loyalists: the mayor of London, Nicholas Brembre, and Alexander Neville, the Archbishop of York. Richard stalled the negotiations to gain time, as he was expecting de Vere to arrive from Cheshire with military reinforcements. The three earls then joined forces with Henry Bolingbroke, Earl of Derby (Gaunt's son, later King Henry IV), and Thomas de Mowbray, Earl of Nottingham – the group known to history as the Lords Appellant. 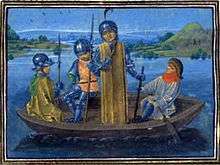 On 20 December 1387 they intercepted de Vere at Radcot Bridge, where he and his forces were routed and he was obliged to flee the country. Richard gradually re-established royal authority in the months after the deliberations of the Merciless Parliament. The aggressive foreign policy of the Lords Appellant failed when their efforts to build a wide, anti-French coalition came to nothing, and the north of England fell victim to a Scottish incursion. Richard was now over twenty-one years old and could with confidence claim the right to govern in his own name. Furthermore, John of Gaunt returned to England in 1389 and settled his differences with the king, after which the old statesman acted as a moderating influence on English politics. Richard assumed full control of the government on 3 May 1389, claiming that the difficulties of the past years had been due solely to bad councillors. He outlined a foreign policy that reversed the actions of the appellants by seeking peace and reconciliation with France and promised to lessen the burden of taxation on the people significantly. Richard ruled peacefully for the next eight years, having reconciled with his former adversaries. Still, later events would show that he had not forgotten the indignities he perceived. In particular, the execution of his former teacher Sir Simon de Burley was an insult not easily forgotten. These actions were made possible primarily through the collusion of John of Gaunt, but with the support of a large group of other magnates, many of whom were rewarded with new titles, who were disparagingly referred to as Richard's "duketti". 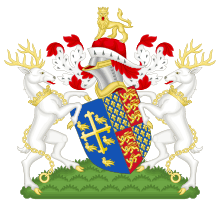 These included the former Appellants Henry Bolingbroke, Earl of Derby, who was made Duke of Hereford, and Thomas de Mowbray, Earl of Nottingham, who was created Duke of Norfolk. Also among them were John and Thomas Holland, the king's half-brother and nephew, who were promoted from earls of Huntingdon and Kent to dukes of Exeter and Surrey respectively; the Duke of York's son Edward, Earl of Rutland, who received Gloucester's French title of Duke of Aumale; Gaunt's son John Beaufort, Earl of Somerset, who was made Marquess of Somerset and Marquess of Dorset; John Montacute, Earl of Salisbury; and Lord Thomas le Despenser, who became Earl of Gloucester. [e] With the forfeited lands of the convicted appellants, the king could reward these men with lands suited to their new ranks. In June 1399, Louis, Duke of Orléans, gained control of the court of the insane Charles VI of France. The policy of rapprochement with the English crown did not suit Louis's political ambitions, and for this reason he found it opportune to allow Henry to leave for England. With a small group of followers, Bolingbroke landed at Ravenspur in Yorkshire towards the end of June 1399. Men from all over the country soon rallied around the duke. Meeting with Henry Percy, Earl of Northumberland, who had his own misgivings about the king, Bolingbroke insisted that his only object was to regain his own patrimony. Percy took him at his word and declined to interfere. The king had taken most of his household knights and the loyal members of his nobility with him to Ireland, so Henry experienced little resistance as he moved south. 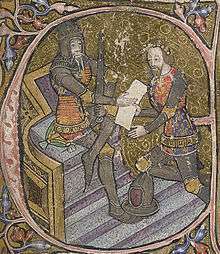 Edmund of Langley, Duke of York, who was acting as Keeper of the Realm, had little choice but to side with Bolingbroke. Meanwhile, Richard was delayed in his return from Ireland and did not land in Wales until 24 July. He made his way to Conwy, where on 12 August he met with the Earl of Northumberland for negotiations. On 19 August, Richard II surrendered to Henry at Flint Castle, promising to abdicate if his life were spared. Both men then returned to London, the indignant king riding all the way behind Henry. On arrival, he was imprisoned in the Tower of London on 1 September. Henry was by now fully determined to take the throne, but presenting a rationale for this action proved a dilemma. It was argued that Richard, through his tyranny and misgovernment, had rendered himself unworthy of being king. However, Henry was not next in line to the throne; the heir presumptive was Edmund Mortimer, Earl of March, who was descended from Edward III's third son, the second to survive to adulthood, Lionel of Antwerp. 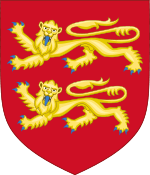 Bolingbroke's father, John of Gaunt, was Edward's fourth son, the third to survive to adulthood. The problem was solved by emphasising Henry's descent in a direct male line, whereas March's descent was through his grandmother. [f] The official account of events claims that Richard voluntarily agreed to abdicate in favour of Henry on 29 September. Although this was probably not the case, the parliament that met on 30 September accepted Richard's abdication. Henry was crowned as King Henry IV on 13 October. The exact course of Richard's life after the deposition is unclear; he remained in the Tower until he was taken to Pontefract Castle shortly before the end of the year. Although King Henry might have been amenable to letting him live, this all changed when it was revealed that the earls of Huntingdon, Kent and Salisbury and Lord Despenser, and possibly also the Earl of Rutland – all now demoted from the ranks they had been given by Richard – were planning to murder the new king and restore Richard in the Epiphany Rising. Although averted, the plot highlighted the danger of allowing Richard to live. He is thought to have starved to death in captivity on or around 14 February 1400, although there is some question over the date and manner of his death. His body was taken south from Pontefract and displayed in the old St Paul's Cathedral on 17 February before burial in Kings Langley Church on 6 March. Rumours that Richard was still alive persisted, but never gained much credence in England; in Scotland, however, a man identified as Richard came into the hands of Regent Albany, lodged in Stirling Castle, and serving as the notional – and perhaps reluctant – figurehead of various anti-Lancastrian and Lollard intrigues in England. 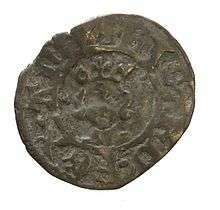 Henry IV's government dismissed him as an imposter and several sources from both sides of the Border suggest the man had a mental illness, one also describing him as a "beggar" by the time of his death in 1419, but he was buried as a king in the local Dominican friary in Stirling. 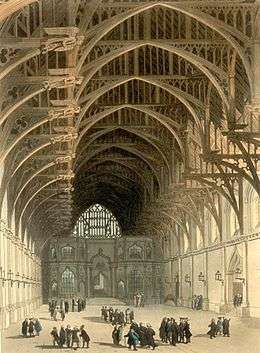 Meanwhile, in 1413, Henry V – in an effort both to atone for his father's act of murder and to silence the rumours of Richard's survival – had decided to have the body at King's Langley moved to its final resting place in Westminster Abbey. Here Richard himself had prepared an elaborate tomb, where the remains of his wife Anne were already entombed. Richard's approach to kingship was rooted in his strong belief in the royal prerogative, the inspiration of which can be found in his early youth, when his authority was challenged first by the Peasants' Revolts and then by the Lords Appellant. Richard rejected the approach his grandfather, Edward III, had taken to the nobility. Edward's court had been a martial one, based on the interdependence between the king and his most trusted noblemen as military captains. In Richard's view, this put a dangerous amount of power in the hands of the baronage. To avoid dependence on the nobility for military recruitment, he pursued a policy of peace towards France. 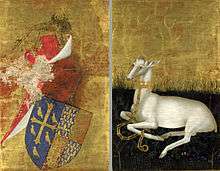 At the same time, he developed his own private military retinue, larger than that of any English king before him, and gave them livery badges with his White Hart, which are also worn by the angels in the Wilton Diptych (right). He was then free to develop a courtly atmosphere in which the king was a distant, venerated figure, and art and culture, rather than warfare, were at the centre. 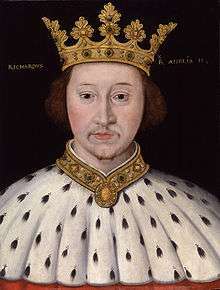 Contemporary writers, even those less sympathetic to the king, agreed that Richard was a "most beautiful king", though with a "face which was white, rounded and feminine", implying he lacked manliness. He was athletic and tall; when his tomb was opened in 1871 he was found to be six feet tall. He was also intelligent and well read, and when agitated he had a tendency to stammer. 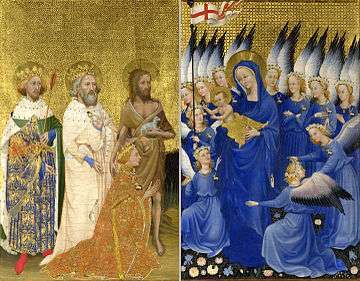 While the Westminster Abbey portrait probably shows a good similarity of the king, the Wilton Diptych portrays the king as significantly younger than he was at the time; it must be assumed that he had a beard by this point. Religiously, he was orthodox, and particularly towards the end of his reign he became a strong opponent of the Lollard heresy. He was particularly devoted to the cult of Edward the Confessor, and around 1395 he had his own arms impaled with the mythical arms of the Confessor. Though not a warrior king like his grandfather, Richard nevertheless enjoyed tournaments, as well as hunting. The popular view of Richard has more than anything been influenced by Shakespeare's play about the king, Richard II. Shakespeare's Richard was a cruel, vindictive and irresponsible king, who attained a semblance of greatness only after his fall from power. Writing a work of fiction, however, Shakespeare took many liberties and made great omissions. Shakespeare based his play on works by writers such as Edward Hall and Samuel Daniel, who in turn based their writings on contemporary chroniclers such as Thomas Walsingham. Hall and Daniel were part of Tudor historiography, which was highly unsympathetic to Richard. The Tudor orthodoxy, reinforced by Shakespeare, saw a continuity in civil discord starting with Richard's misrule that did not end until Henry VII's accession in 1485. The idea that Richard was to blame for the later-15th century Wars of the Roses was prevalent as late as the 19th century, but came to be challenged in the twentieth. More recent historians prefer to look at the Wars of the Roses in isolation from the reign of Richard II. Richard's mental state has been a major issue of historical debate since the first academic historians started treating the subject in the 19th century. One of the first modern historians to deal with Richard II as a king and as a person was Bishop Stubbs. Stubbs argued that towards the end of his reign, Richard's mind "was losing its balance altogether". Historian Anthony Steel, who wrote a full-scale biography of the king in 1941, took a psychiatric approach to the issue, and concluded that the king had schizophrenia. This was challenged by V.H. Galbraith, who argued that there was no historical basis for such a diagnosis, a line that has also been followed by later historians of the period, like Anthony Goodman and Anthony Tuck. Nigel Saul, who wrote the most recent academic biography on Richard II, concedes that – even though there is no basis for assuming the king had a mental illness – he showed clear signs of a narcissistic personality, and towards the end of his reign "Richard's grasp on reality was becoming weaker". One of the primary historiographical questions surrounding Richard concerns his political agenda and the reasons for its failure. His kingship was thought to contain elements of the early modern absolute monarchy as exemplified by the Tudor dynasty. More recently, Richard's concept of kingship has been seen by some as not so different from that of his antecedents, and that it was exactly by staying within the framework of traditional monarchy that he was able to achieve as much as he did. Yet his actions were too extreme, and too abrupt. For one, the absence of war was meant to reduce the burden of taxation, and so help Richard's popularity with the Commons in parliament. However, this promise was never fulfilled, as the cost of the royal retinue, the opulence of court and Richard's lavish patronage of his favourites proved as expensive as war had been, without offering commensurate benefits. As for his policy of military retaining, this was later emulated by Edward IV and Henry VII, but Richard's exclusive reliance on the county of Cheshire hurt his support from the rest of the country. As Simon Walker concludes: "What he sought was, in contemporary terms, neither unjustified nor unattainable; it was the manner of his seeking that betrayed him." ↑ Barber, Richard (2004). "Edward , prince of Wales and of Aquitaine (1330–1376)". Oxford Dictionary of National Biography. Oxford: Oxford University Press. doi:10.1093/ref:odnb/8523. ↑ Barber, Richard (2004). "Joan, suo jure countess of Kent, and princess of Wales and of Aquitaine [called the Fair Maid of Kent] (c. 1328 – 1385)". Oxford Dictionary of National Biography. Oxford: Oxford University Press. doi:10.1093/ref:odnb/14823. 1 2 3 4 5 6 7 8 9 10 11 12 13 14 15 16 17 18 19 20 21 22 23 24 25 26 Tuck (2004). ↑ Saul (1997), p. 12. ↑ Saul (1997), p. 17. ↑ Saul (1997), p. 24. ↑ McKisack (1959), pp. 399–400. ↑ Harriss (2005), pp. 445–6. ↑ Harriss (2005), pp. 229–30. ↑ Harriss (2006), pp. 230–1. 1 2 Harriss (2006), p. 231. ↑ Saul (1997), p. 67. ↑ McKisack (1959), p. 409. ↑ Saul (1997), p. 68. ↑ Saul (1997), pp. 68–70. ↑ Saul (1997), pp. 70–1. ↑ McKisack (1959), pp. 413–4. ↑ McKisack (1959), p. 424. ↑ Saul (1997), p. 90. The marriage had been agreed upon as of 2 May 1381; Saul (1997), p. 87. ↑ Saul (1997), pp. 94–5. ↑ Saul (1997), p. 225. ↑ Saul (1997), pp. 117–20. ↑ A complaint in parliament claimed that he had been "raised from low estate to the rank of earl"; Saul (1997), p. 118. ↑ Saul (1997), p. 117. ↑ Harriss (2005), p. 98. ↑ McKisack (1959), pp. 425, 442–3. ↑ Saul (1997), p. 437. ↑ Saul (1997), pp. 142–5. ↑ Saul (1997), pp. 145–6. ↑ Saul (1997), p. 157. ↑ McKisack (1959), p. 443. ↑ Saul (1997), p. 160. ↑ Saul (1997), pp. 157–8. ↑ Saul (1997), p. 158. ↑ Harriss (2005), p. 459. ↑ Tuck (1985), p. 189. ↑ Goodman (1971), p. 22. 1 2 Saul (1997), p. 187. ↑ Goodman (1971), pp. 129–30. ↑ Neville, as a man of the clergy, was deprived of his temporalities, also in absentia; Saul (1997), pp. 192–3. 1 2 Saul (1997), pp. 203–4. ↑ Harriss (2005), p. 468. ↑ Saul (1997), p. 367. ↑ Saul (1997), pp. 215–25. ↑ Saul (1997), p. 227. ↑ (As it turned out, she never did produce an heir: just four years later, Richard was dead.) McKisack (1959), p. 476. ↑ Tuck (1985), p. 204. ↑ Harriss (2005), p. 511. ↑ Saul (1997), pp. 279–81. ↑ Saul (1997), p. 203. ↑ Saul (1997), pp. 371–5. ↑ Harriss (2005), p. 479. ↑ Saul (1997), p. 378. ↑ Saul (1997), pp. 378–9. ↑ Tuck (1985), p. 210. 1 2 Saul (2005), p. 63. ↑ Saul (1997), pp. 196–7. ↑ Harriss (2005), p. 482. ↑ Saul (1997), pp. 403–4. ↑ Saul (2005), p. 64. ↑ McKisack (1959), p. 491. ↑ Gardiner, Samuel R. (1916), Student's History of England from the Earliest Times to the Death of King Edward VII, vol. I.: B.C. 55—A.D. 1509. Longman's. ↑ Saul (1997), pp. 406–7. ↑ Saul (1997), p. 408. ↑ Saul (1997), pp. 408–10. ↑ Harriss (2005), pp. 486–7. ↑ Saul (1997), p. 411. ↑ Saul (1997), pp. 412–3. ↑ "Richard II, King of England (1367–1400)". Luminarium.org. Retrieved 2012-08-17. ↑ Saul (1997), p. 417. ↑ McKisack (1959), pp. 494–5. ↑ Saul (1997), pp. 419–20. ↑ Given-Wilson, C. (1993). "The manner of King Richard's renunciation: A Lancastrian narrative?". English Historical Review. cviii (427): 365–71. doi:10.1093/ehr/CVIII.427.365. ↑ Saul (1997), p. 423. ↑ Saul (1997), p. 424. ↑ Saul (1997), p. 424–5. ↑ Tuck (1985), p. 226. ↑ Saul (1997), p. 428–9. ↑ Saul (1997), pp. 331–2. ↑ Saul (1997), p. 340–2. ↑ Saul (1997), pp. 344–54. ↑ Harris (2005), pp. 489–90. ↑ Harris (2005), pp. 490–1. 1 2 Saul (1997), p. 439. ↑ Harris (2005), p. 28. ↑ Saul (1997), pp. 332, 346. ↑ Saul (1997), p. 238. ↑ Alexander and Binski, pp. 134–135. See also Levey, pp. 20–24. ↑ Brown, R. A.; H. M. Colvin; A. J. Taylor, eds. (1963). History of the King's Work. i. London: HMSO. pp. 527–33. ↑ Alexander and Binski, pp. 506–7 and 515. Only six of the statues remain, rather damaged, and the dais has been remodelled, but otherwise the hall remains largely as Richard and his architect Henry Yevele left it. ↑ Saul (1997), p. 315. ↑ Saul (1997), pp. 361–4. ↑ Benson, Larry D., ed. (1988). The Riverside Chaucer (3rd ed.). Oxford: Oxford University Press. pp. xi–xxii. ISBN 0-19-282109-1. ↑ McKisack (1959), pp. 529–30. ↑ Benson (1988), p. xv. ↑ Saul (1997), pp. 362, 437. ↑ Saul (2005), p. 237. ↑ Saul (1997), pp. 451–2, quoting John Gower and Historia vitae et regni Ricardi II. ↑ Harriss (2005), p. 489. ↑ Saul (1997), pp. 450–1. ↑ Saul (1997), pp. 297–303. ↑ Saul (1997), pp. 452–3. ↑ Saul (1997), p. 1. ↑ Saul (1997), pp. 3–4. ↑ Saul (2005), pp. 11–2. ↑ Aston, Margaret (1984). "Richard II and the Wars of the Roses". Lollards and Reformers: Images and Literacy in Late Medieval Religion. Continuum International Publishing Group. pp. 273–312. ISBN 0-907628-18-4. ↑ Pollard, A.J. (1988). The Wars of the Roses. Basingstoke: Macmillan Education. p. 12. ISBN 0-333-40603-6. ↑ Carpenter, Christine (1997). The Wars of the Roses: Politics and the Constitution in England, c. 1437–1509. Cambridge: Cambridge University Press. p. 20. ISBN 0-521-31874-2. ↑ Stubbs, William (1875). The Constitutional History of England. vol. ii. Oxford: Clarendon Press. p. 490. ↑ Steel (1941), p. 8. ↑ Galbraith, V. H. (1942). "A new life of Richard II". History. xxvi (104): 223–39. doi:10.1111/j.1468-229X.1942.tb00807.x. ↑ Walker, Simon (1995). "Richard IIs Views on Kingship". In Rowena E. Archer; G. L. Harriss; Simon Walker. Rulers and Ruled in Late Medieval England. London: Hambledon Press. p. 49. ISBN 1-85285-133-3. 1 2 Walker (1995), p. 63. ↑ "Margaret Wake, Baroness Wake". The Peerage. 24 January 2013. ↑ Tuck, Anthony (2004). "Edmund , first duke of York (1341–1402)". Oxford Dictionary of National Biography. Oxford: Oxford University Press. doi:10.1093/ref:odnb/16023. ↑ Saul (1997), pp. 71–2. ↑ "appeal, n.". Oxford Dictionary of English. Retrieved 25 August 2008. (subscription required (help)). ↑ Saul (1997), pp. 381–2. ↑ Tuck (1985), p. 221.